This simple command encapsulates the philosophy that drives Zack and Emily Kosta. Make Something. Emily has the phrase tattooed on her arm. These are not your typical Portland artists. Not only have they dedicated themselves fully to their own artistic expression, they have become creative catalysts for many others. 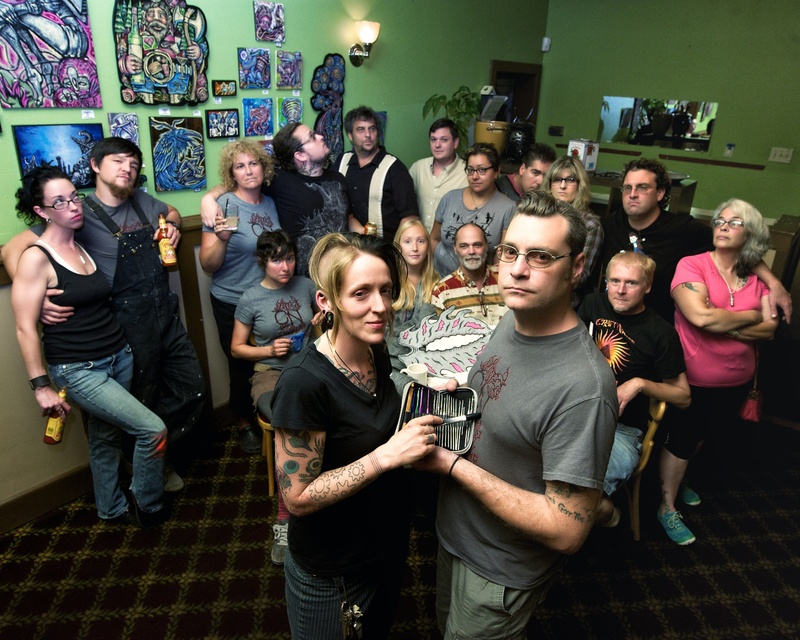 One cold and wet October evening in 2007, the Kostas huddled in a bar in their Foster-Powell neighborhood creating art. 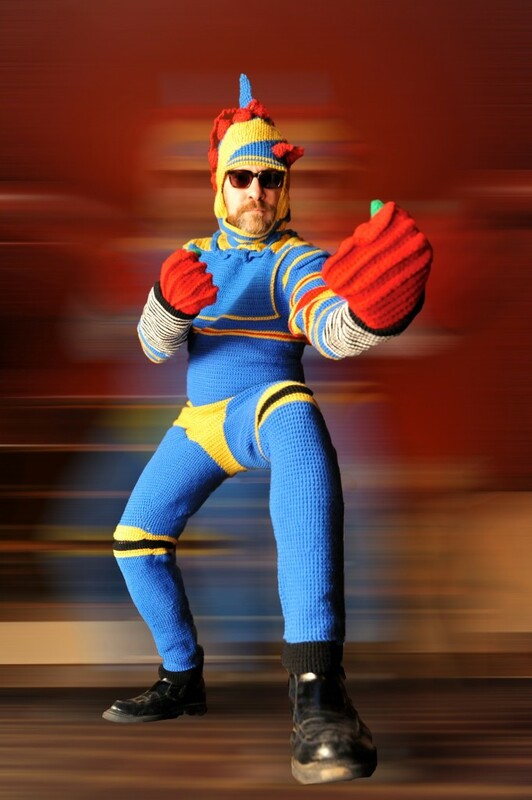 Zack was in the midst of crocheting a full body suit, which has since spawned his huggable alter ego, Captain Cozy. Emily was finishing her chain mail, a perfect creation befitting her punk rock persona. They soon realized that if they so enjoyed creating art at their local watering hole, others would surely feel the same way. They began spreading the good word and soon Craft Night was born. Zack can pinpoint the exact moment when his personal evolution toward becoming an artist began. The life-changing moment came his junior year of high school. Zack had promised Mr. Brown, his art teacher and mentor, that he would take part in a regional art competition outing. As the bus was about to leave, a very tardy young Zack climbed aboard. Mr. Brown barked, “You’re late, Mr. Kosta! Why should I let you on the bus?” Zack replied, “Yes, I’m late, but my piece is done. Look at it. Let’s go!” Zack was the only kid at his school that won a ribbon that day; and that initial look of disappointment on his teacher’s face, and his decision to let Zack board the bus, left such an indelible impression that to this day Zack refuses to be late for anything, and he always keeps his promises. Zack has sculpted his life in a way that could never disappoint Mr. Brown today. Years ago, while working at a bank and realizing that every day was the worst day of his life, Zack decided to have all ten fingers tattooed with art and measurements tools, ensuring that he would never work in a bank again. Emily grew up with similar supporters championing her artistic aspirations. Her parents let her cover every inch of her bedroom with drawings and angsty teenage graffiti. Her beloved grandmother Fay offered to pay for her to go to art school; Emily turned that offer down and still feels that was the right decision for her. Emily now supports others’ art dreams, just as hers were supported. The Kostas live a fully-realized creative life on their own terms. A tour through their house (which they share with several pets, including Baffy, the three-legged cat) is like a walk through some strange and wonderful goth gallery. Whimsical creations and wonderfully bizarre paintings line the walls, surrounding a collection of animal bones, Pez dispensers, a vintage key collection, a live tarantula, and full-sized samurai warrior battle armor. When they’re not at their day jobs (Zack works at a local printing press and Emily cooks at an elder care facility) they help curate art exhibits for their fellow Craft Night colleagues, spearhead creative group projects, and volunteer at Gallery Homeland in the Ford Building. They even find time on Tuesdays to make experimental music with friends. The word art lies within the word heart. And with these two fervent artists, there is a lot of it to go around. They have earned the respect and admiration of the art community they have built. Craft Night, their brainchild, has evolved into a regular Thursday-night event at Bar Carlo on Foster Road, where artistically inclined neighborhood folks get together to drink and draw. The vibe is mellow and nurturing. Craft Night’s mission statement is straightforward: To bring creative thinkers together in a positive environment for the purpose of art, ideas, and production. The Kostas are adamant that, as with art, Craft Night has no rules, except one: “Be nice to one another.” Apply that simple wisdom with a glue stick. When asked why art is so important to her, Emily says, “Art elevates humanity—it expands our minds.” It gives one hope to see two people who share such an intensely passionate purpose come together in life and inspire so many others through their devotion and talents. A more beautiful, modern day, Portland-esque love story is hard to find.